The Robotic Follower Advanced Technology Demonstration (ATD) is focused on the maturation & demonstration of robotics technology required for early insertion into Future Combat Systems (FCS). The Robotic Follower ATD will develop, integrate and demonstrate the technology required to achieve unmanned follower capabilities for future land combat vehicles. This technology will provide a core capability required to conduct a wide variety of FCS/Objective Force applications such as Ruck Carrier, Supply Platoon, NLOS/ BLOS Fire and Rear Security and also support manned combat, tactical, and support Vehicles. TACOM and ARL are teaming in the Robotic Follower ATD to provide a near-term application of robotic technologies to the FCS program. The Robotic Follower ATD will develop, integrate, and demonstrate the technology required to achieve unmanned follower capabilities that will support a wide variety of FCS/Objective Force applications such as: (1) ruck carrier; (2) supply platoon; (3) non-line-of-sight (NLOS)/beyond line of sight (BLOS) fire, and (4) rear security. Many studies support the benefits offered by robotics technologies in key areas that are required for the FCS program. In order to marry the technology to the requirements in a reasonable time-frame, the RF ATD adopts an approach to semi-autonomous mobility that lowers the perceptual and planning requirements of the unmanned systems. The concept of operations entails a manned leader (dismounted soldier or another vehicle) to provide a high-level proofing of the follower's path, avoiding areas that would impede or confuse the unmanned follower. This reduces both the perceptual and planning demands on the follower. The lead system maneuvers over a tactically significant route and passes electronic breadcrumbs, e.g., Global Positioning Satellite (GPS) positions, to the following systems. These systems then perform semi-autonomous following of the lead vehicle, operating with minimal user intervention. The Army Vision calls for an Objective Force that is rapidly deployable, extremely lethal, yet highly survivable. 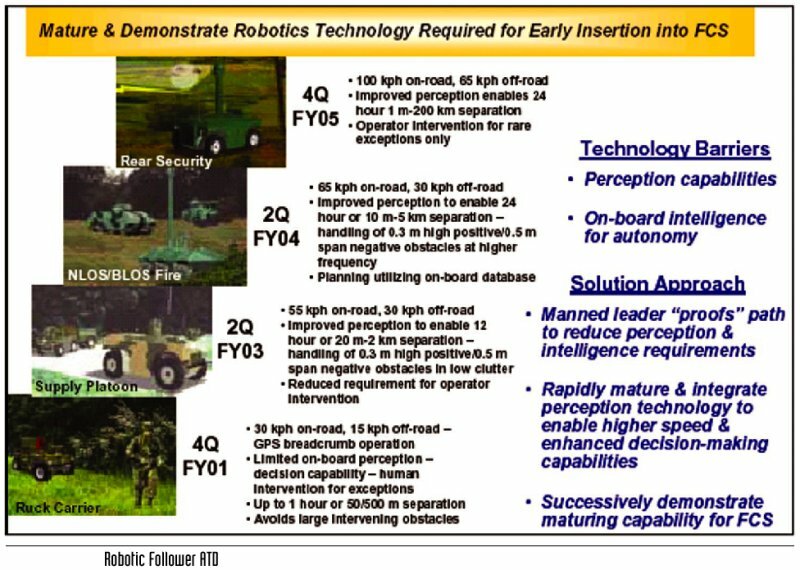 Extensive infusion of unmanned ground vehicle systems into the Objective Force offers a viable path toward achieving those goals, however these technologies are not envisioned to be mature enough to impact early Objective Force systems, specifically the FCS. The Robotic Follower ATD is uniquely positioned to provide a mature unmanned capability to the FCS program through the development and demonstration of the requisite technology, assuring achievement of appropriate maturity levels prior to initiation of the formal materiel acquisition process and offering the opportunity to initiate development of the tactics, techniques and procedures necessary to effectively utilize this new technology. On September 25, 2001 General Dynamics Land Systems, Sterling Heights, Mich., was awarded a $500,000 increment as part of a $23,051,717 cost-plus-fixed-fee contract for four years of research and development of a Vetronics Technology Integration effort. This project will integrate technologies into Stryker interim armor vehicle (IAV) C-130 transportable vehicle platforms and support demonstrations of these systems during field tests. These platforms will be used for advanced technology demonstrations of the Crew Integration and Automation Testbed (CAT - Manned Lead Vehicle) and the Robotic Follower (RF - Unmanned) Programs as a step toward possible transition to the Future Combat System. Work will be performed in Westminster, Md. (55.89%), and Sterling Heights, Mich. (44.11%), and completion is expected by Sept. 24, 2005. Contract funds will not expire at the end of the current fiscal year. The U.S. Army Tank-Automotive & Armaments Command, Warren, Mich., is the contracting activity (DAAE07-01-C-L089). 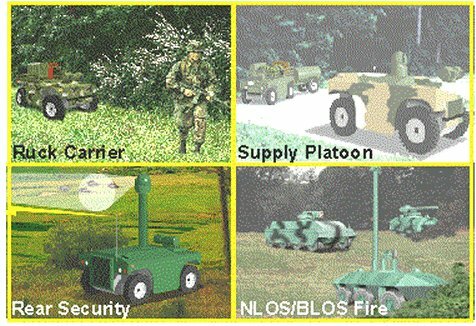 The Robotic Follower (2001-05) ATD develops, integrates, and demonstrates the set of technologies required to achieve unmanned follower capabilities for future land combat vehicles. These technologies will support a wide variety of FCS/Objective Force applications. A key tenet for the robustness and speed of the follower systems is the ability of the manned leader to provide a high-level proofing of the follower's path, avoiding areas that would impede or confuse the unmanned followers, which operate with minimal user intervention. This STO employs a series of demonstrations that will successively increase the follower performance and improve the maturity of the software algorithms, SMI, and sensor technology for transition to the FCS program. The goal is to demonstrate an enhanced follower with the capability to maneuver on primary roads with a top speed of between 80kph and 100kph and off-road at speeds of up to 65kph. The range of potential vehicle separation will increase to between 5m and 10km. Increased focus upon vehicle intelligence and software reliability. The program is focused on a series of demonstrations that will successively increase the follower performance and improve the maturity of the software algorithms, soldier-machine interface, and sensor technology for transition to the FCS program. The first live RF experiment in 2Q FY03 will employ the Demo III+ XUV systems as well as the selected final platform, which is the infantry carrier that is a variant of the Interim Armor Vehicle (IAV) based on the Light Armored Vehicle (LAV III). Two mission scenarios will be demonstrated: (1) convoying, which is defined by on-road, high speed, line-of-sight following in order to address the supply platoon mission, and (2) robotic MULE, which is defined by all terrain, low speed following of a dismounted soldier. These two vignettes will demonstrate RF capability at a TRL 6. The second live experiment will take place in the FY05-FY06 timeframe and will demonstrate and evaluate high-speed, all terrain following with significant spatial and temporal separations. A virtual development environment will be developed to enable algorithm tests and development, and to conduct modeling and simulation experiments focused on determining technology performance in varying terrain databases. Partnered with other Department of Defense researchers, engineers from the U.S. Army Tank Automotive Research, Development and Engineering Center (TARDEC), developed and demonstrated a totally remote controlled Light Armored Vehicle (LAV II) capable of launching both an Unmanned Aerial Vehicle (UAV) and a fire-and-forget missile on the move. This remarkable feat, six months in the making, successfully illustrated that it is possible to field unmanned vehicles that are capable of performing multiple tasks for the Future Combat System. The success was a direct result of the Objective Force Test Bed Team-a coalition of engineers from TARDEC, AMRDEC and DARPA. The team's simple challenge was "to totally remote" a Future Combat System type vehicle that would be capable of launching a fire-and-forget missile while the vehicle was moving. The LAV II remote control kit was designed and built completely in house by TARDEC's E/RMC team in only three months. Capable of being installed in less than three hours and with no permanent vehicle modifications, the kit consists of a receiver interface, a transmitter interface, actuators and two specialized radios. The testing, done at Eglin Airforce Base, was so successful that seven UAV launches were completed. Beaming from the positive UAV results the team then fired a Javelin anti-tank missile from a new state-of-the-art tele-operated turret on the moving LAV. Success was again achieved, with the perfectly aimed Javelin killing its target 1800 meters away.